Today, we’re kicking off a fabulous new tradition of interviewing stellar growers and professional nurseries. 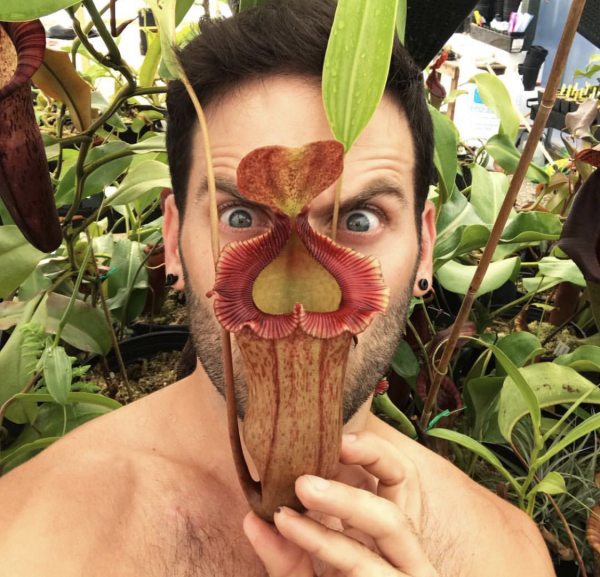 I’m thrilled to have, as our very first interviewee, Domonick Gravine of Redleaf Exotics who jumped the gap from hobbyist to professional crack dealer… ::ahem:: Nepenthes nurseryman using expert growing skills, business acumen, and a metric ton of passion. 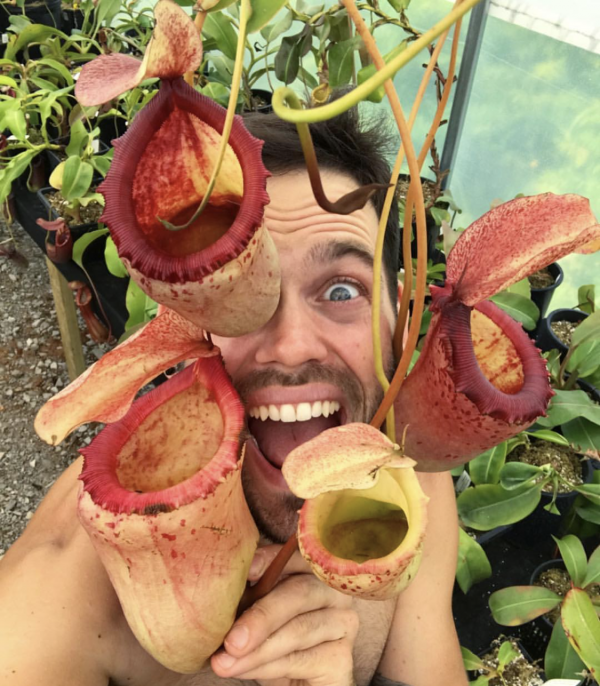 To say that Domonick is enamored with Nepenthes would be the understatement of the century. 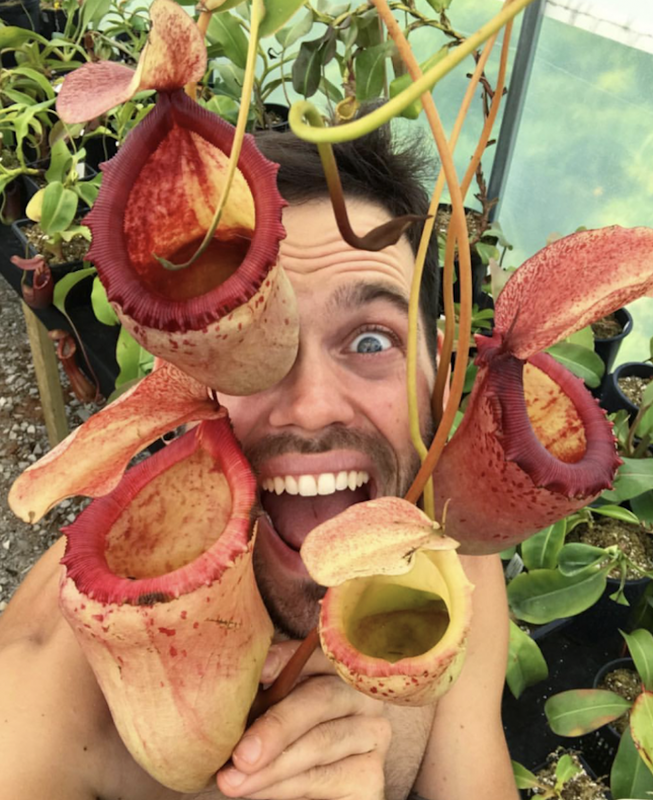 Domonick loves Nepenthes like zombies love brains. Like sand loves hard-to-reach places. Like Kanye West loves Kanye West… you get the point. Hey Domonick, can you give an introduction to Redleaf Exotics? Redleaf Exotics is a Nepenthes nursery I started a little over a year ago. I loooooove Nepenthes and specialize in seed grown species and Exotica Plants hybrids. How long have you been growing carnivorous plants? I have been growing for 20 years now! Time flies! That’s a good run! What first drew you to carnivorous plants? As a child, I found some Venus flytraps at our local hardware store. 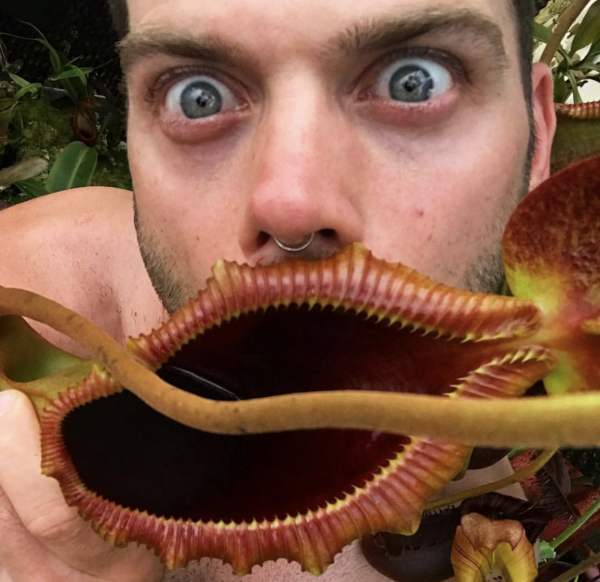 These were plants with jaws that actually ate bugs?…who wouldn’t be interested?! Amongst them, I found a single Nepenthes plant. I took it home and searched “NEPENTHES” on the web. OMG! I instantly became addicted! Neat! I know a lot of us started in a very similar way. You’ve definitely had time to hone your horticulture craft. What’s your growing ethos? My ethos is ‘LOVE THEM AND THEY WILL GROW’ And by ‘love,’ I mean do anything you can to achieve success and make your Nepenthes happy . I sing to my plants, dance around them and experiment. I take in as much knowledge as I can from other growers and watch the plants closely to see their responses to how I treat them. I’m always fine tuning my techniques and like any dedicated parent I’ll always give my Neps whatever they need to thrive! 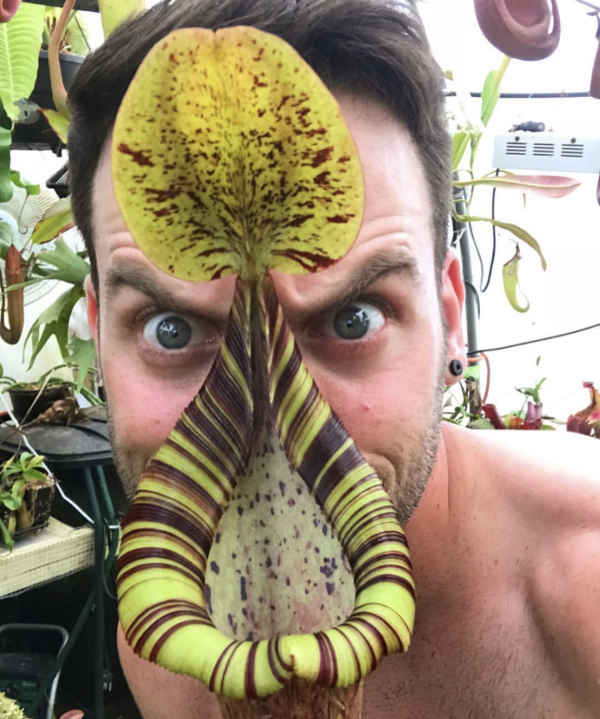 Learning how to love Nepenthes takes a bit but anyone can do it . I’ll try and keep this in a nutshell, but my career change blossomed beautifully. I grew Nepenthes since 13 years old and no matter where I lived I always had some plants with me. Collections grew big and small as I moved around, and as time went on I followed my in-the-moment path toward fashion photography. It was an amazing journey and it led me to NYC! I grew Nepenthes in my apartment there and I still wanted more! I even looked for greenhouse spaces. Still working in photography, I decided to take a vacation trip to the worlds best Nepenthes Nursery in Australia, Exotica Plants! The owners, Geoff and Andrea Mansell were my heros in the Nepenthes world and also both Pisces like me! I’ve had a relationship with them online for years prior to my visit. This trip was my second biggest goal in life beside visiting Borneo and it changed my life! As I gazed upon the largest and most beautiful Nepenthes plants I’d ever seen, something HIT ME! I will never forget leaning back against the bench and thinking “this is what I want to do for the rest of my life!’ Their entire life inspired me! I returned to NYC with enough passion and inspiration that I ended up finding a plot of land in Brooklyn and building a 14 x 25 ft greenhouse. Having a connection with Exotica Plants and being able to grow the plants well, Redleaf Exotics emerged! The journey and path has really lit up and everything fell into place. What was that journey of scaling/growing your collection to handle retail sales like? Growing in a 14 x 25ft greenhouse was a little cramped, but nobody can nicely cram Nepenthes together like me haha! I only had about 50 plants originally, but I first started with doing a group Exotica import and ordered some excess stock for resale. I did small updates here and there and after a couple EP imports there were a lot of plants around! Taking cuttings and selling some personal plants also added in. I kept my photography job until things really took off, then I focused all my attention on Nepenthes! It definitely feels interesting getting in plants and selling them off. I want to keep them all…. As the plants grow, so does the business. Speaking of your greenhouse – you recently moved! What’s your current setup? The current setup is a 24 x 72ft polytunnel. Its covered in 70% white shade cloth and cooled with a 20ft evaporative cooling wall the runs the front of the greenhouse and two large exhaust fans that pull the air through it. We have hard water here, so I’ve been collecting rainwater in barrels and using a hose on a pump to water. The plants have been responding really well! I will heat with a large Modine heater, but we are still in summer. Four circulation fans in the ceiling keep that air fresh! So fresh and so clean. Sounds like you’ve got the greenhouse dialed in! When new growers come into the shop, what are your recommended beginner plants? I ALWAYS recommend N. truncata hybrids! I loooove them, they get large and usually pretty colorful. In my experience, these hybrids can be acclimated quite easily indoors with a little extra attention. Truncata x boschiana, truncata x ovata…pretty much anything truncata. After this, I usually go with N. ventricosa hybrids. Many newbies have been very successful with my recommendations and are now collectors themselves! Don’t drink the pitcher fluid! What advice do you give to more advanced growers who come into the shop? We tend to just drool over the plants and exchange growing ideas. I get it. I carry napkins to dabble up spontaneous plant drool. What is your top tip/trick for growing carnivorous plants that other growers may not know? I don’t feel there is any trick or secret to growing these plants. Everyone has different conditions which requires different cultural tweaks. I do notice the plants seem to feel my passion for them . So love is definitely an ingredient in my culture. Experimenting always leads one in a direction toward a better understanding of these plants and I highly encourage it! Love is always the best ingredient. That’s how my mom makes the best cookies. Are there any plants that you’re especially proud to have in your collection? – Rarities, self-developed cultivars/hybrids, etc? I mean, I’ve got an appetite for french fries, but I haven’t gone through the trouble of evolving an organ for deep frying potatoes. These plants never cease to amaze me! 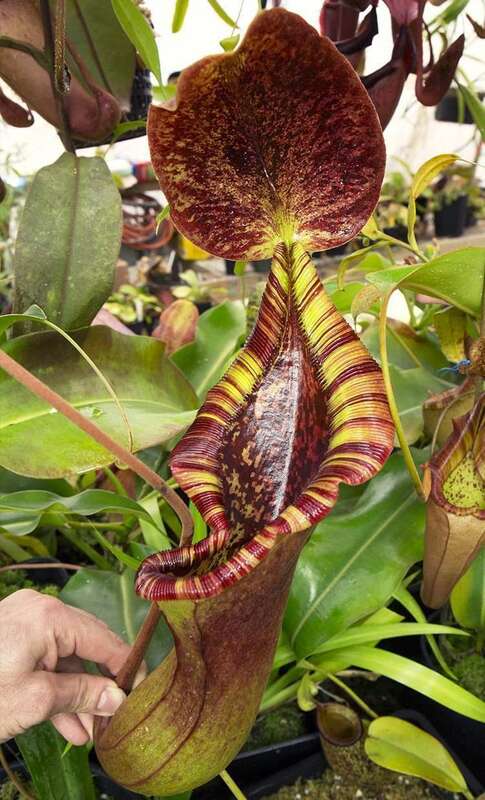 What are your 3 all-time favorite carnivorous plants and why? NEPENTHES! NEPENTHES! NEPENTHES! I mean I look at them and can’t even comprehend how something so complex has evolved. They are so colorful and look like hand-painted works of art. 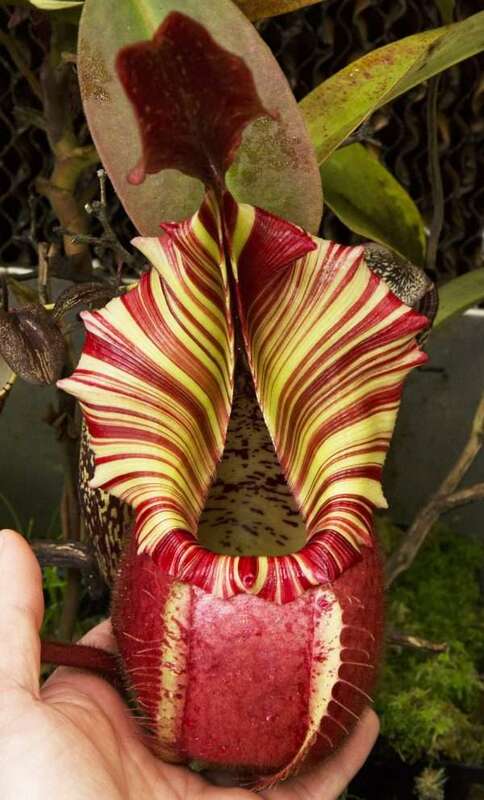 Nothing in this life speaks to my like NEPENTHES!!! Have I expressed my excitement enough, because I can go on and on!!!! Yeah, I should have guessed that. Working on any exciting new plans for the nursery, or plant offerings? There is a lot going on behind the scenes that I can’t really share yet, but we have some really amazing opportunities ahead! I have been doing a lot of cross-breeding with select plants and the offspring should be to die for! All I can say is expect some wild peristomes and lots of veitchii influences . Thanks so much for your time, Domonick! Happy growing, and if you ever want to build a Nepenthes amusement park, I know some folks over at Disney who can help out!